From luxury resorts on the Normandy coast to half-timbered medieval hotels in the town center, Honfleur has the hotel, inn or guest house you want. Honfleur has several dozen good hotels, inns and guest houses (chambres d-hôtes) in all price ranges and levels of comfort, from the lush La Ferme Saint Simeon, a 5-star, 34-room luxury resort right on the Normandy coast, and the 4-star, 10-room mansion called Le Manoir des Impressionnistes, to the charming, moderately-priced 2-star, 34-room Hôtel du Dauphin right in the town center. 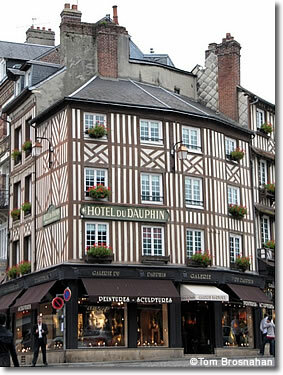 Honfleur also has simple lodgings of which the 4-room Chambres d'hôtes Au Bois Normand is a fine example.